Surprise, surprise! I love yet another of Victoria Schwab's books! You are all shocked! We've all experienced the dreaded sequel-itis ... we love a book. Then, rejoice! A new book is announced! But in addition to overwhelming joy and frantic preorders, there's that feeling of, what if it's not as good as the first one? Even worse, what if nothing happens in this middle book? You know that feeling when you love something, and you're instantly given an identical thing? Logically, you should be overjoyed! But the bookworm life is not logical, and let's be honest, it's very hard to love a series that's basically the same formula done again, and again, and again. 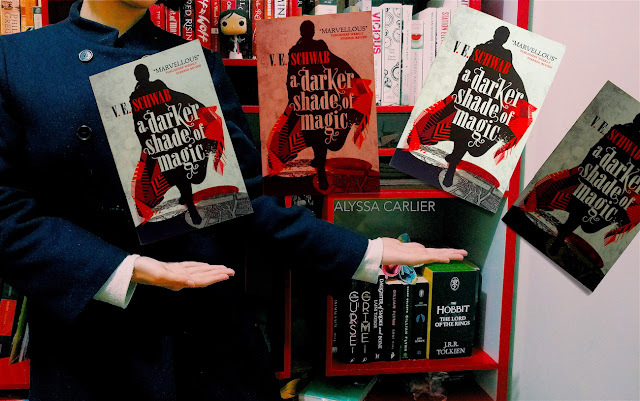 In AGOS, we're introduced to the Element Games, a competition between Red London's best magicians, and oh my goodness were the duels fantastic. The duels in ADSOM were based on Antari/blood magic, but this was elemental magic taken to its finest and much less life-or-death. The entire plot structure was different but equally fabulous. I also liked that AGOS was more character-based than plot-based. We see Lila adapting to life in Red London without compromising her own personality, we see Kell navigating his relationship with his foster parents and Rhy, and we see Rhy attempting to live up to his status as the royal heir despite not having magic. Kell & Rhy: oh my goodness, they are the cutest. 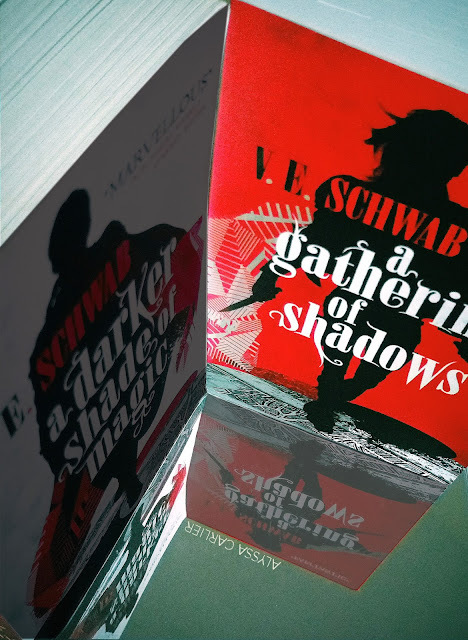 The characters grew so much in A Gathering of Shadows and were my favourite part of this book. Well, minus the quips. I can't resist a good quip. You know that feeling when you love something, and then you get a thing that's supposed to be a follow-up to that but is mostly irrelevant? Nope, me neither. A sequel isn't just another book set in the same world with the same characters. A sequel is literally a continuation of an already existing story. Dropping all the characters' emotional arcs and baggage and making them walk the same steps kind of ignores what we loved in the first place. Plus as perfectly kind-hearted bookworms, we love to see characters suffer the consequences of their decisions. While this normally happens within a book, the same applies to a series — even if the ending seemed happy, a sequel is the perfect time to turn it bittersweet. 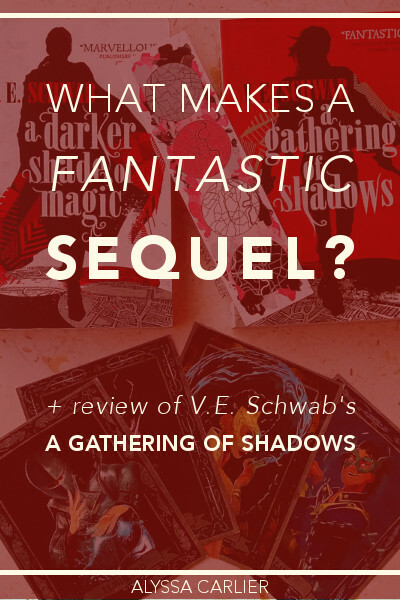 A Gathering of Shadows picks up four months after ADSOM, but it's not just another story in the four Londons. Neither Lila nor Kell have forgotten their ADSOM adventures or, indeed, each other. The characters are all affected by the events of ADSOM — and I love that no one gets to escape the consequences of their choices, and that so many of their decisions are rooted in what we last saw happen. And there were so many call backs to book 1! Lila's masquerade costume, the magic enthusiast Ned in Grey London, mentions of the Dane twins, the three London pubs ... you can bet I was grinning every time those came up. PSA to The Force Awakens: this is how you write a sequel that's not a carbon copy of a successful original while still giving fans a nostalgia kick. This is especially true for speculative fiction, but a sequel is an opportunity to expand the worldbuilding beyond the basics. I mean, just look at all the Tumblr headcanons — we LOVE to know more details about their fandom. 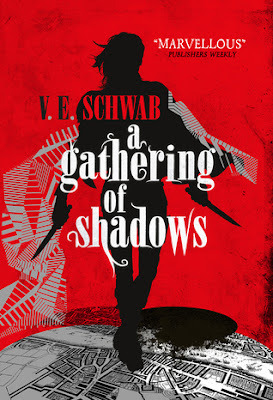 And oh my goodness, A Gathering of Shadows makes me want to go to Red London SO MUCH. The Element Games provided the perfect opportunities for other Red London cities. Other non-Antari magicians. Other members of the royal family and the court. And more magic, of course. This book's focus was really on Red London, though. Grey London had some new incidents but mostly felt like set-up for book 3. I did love the direction taken with White London — we saw touches here and there, but only what was necessary to drive the plot forward. (I hadn't realised how hard writing a non-spoiler review is.) But I love that the previous balance of the four Londons isn't taken for granted and that the world is as dynamic as the characters or the plot. Just as characters shouldn't forget their arcs from the last book, they need NEW arcs in a sequel. Relationships can take on other dimensions (and no, I don't mean romance, there are so many ways to do this — rivalries, guilt, passive aggressiveness ...). Characters who never got to meet last time can meet again. What impressed me most with AGOS was that not only were the characters confronted by their experiences in the first book, they also confronted their past experiences. Lila is SO BADASS. I know, I know, she already was fabulous in ADSOM. But she takes it to the next level. Even though she's new to Red London magic, she has the most creative ideas about it. And she has the best quips. Basically Lila is queen. I'm actually wondering whether Lila should be referred to as they out-of-universe since Word of God is that Lila is genderfluid? Thoughts, people? Kell omg. He shows more of his vulnerable side in this book and his brotherly relationship with Rhy actually made me give up my Kell/Rhy ship. Rhy, my royal sinnamon roll :') He tries his best to change for the better but also wants to stay in his comfortable pre-ADSOM life and basically needs hugs. Please send him hugs. Related post: check out my discussion on which type of villain death is the BESTEST. If the third book cover isn't black or grey, I will cry. I get it. It's a middle book. There needs to be a third book (and you can bet I am ready to read it ANYTIME, excuse me.) And the character development and worldbuilding was phenomenal ... but the plot was practically non-existent until we got to the halfway point. In conclusion, A Gathering of Shadows wrecked my heart into a million pieces and I loved it and you must read it. That's all. Thank you to my mother for the birthday gift, even though I abandoned homework for it! A GATHERING OF SHADOWS debuted on the NYT bestselling list — and it ABSOLUTELY deserves it. In many ways, things have almost returned to normal, though Rhy is more sober, and Kell is now plagued by his guilt. Restless, and having given up smuggling, Kell is visited by dreams of ominous magical events, waking only to think of Lila, who disappeared from the docks like she always meant to do. As Red London finalises preparations for the Element Games—an extravagant international competition of magic, meant to entertain and keep healthy the ties between neighbouring countries—a certain pirate ship draws closer, carrying old friends back into port. Have you read A Darker Shade of Magic and/or A Gathering of Shadows? What's the best middle book you've read? AND! What do you think makes a fantastic sequel? Join my takeout army to receive monthly letters of magic, madness, and murder!